In my last post, I outlined some of the ways I hoped to structure an Undertale collection. Here, I have an actual image of what that might look like. Because there are a number of issues dealing with ownership here, I only have a mock-up with a few files, rather than the whole collection. “Datamined”: Information gathered from datamining, as presented on Mirrawr’s website. This includes a number of HTML pages and at least one PDF. “Videos”: These are videos of Let’s Plays of Undertale. Includes a full Neutral/Pacifist run and a full Genocide run, with selected and compartative clips in the “Consequences” folder. “Wiki”: Contains all pages from the Undertale Wiki. Aside from the issues I raised in my last post, here are some considerations I made about this material. For the purposes of this AIP, I have acquired the files simply by going to the page, right clicking, and hitting “Save Page as…” While this may have its problems (and indeed certain elements like ads broke), it saves the pages quickly and seemingly with a good bit of extra data. Because I am not concerned here with the look of the wiki as much as the text on it, these HTML documents do well even in a text editor to give users/readers the information needed to understand Undertale. Ideally, I think a software like Archive-it would be ideal, but not crucial. PDFs could also be obtained, but I rather like having a bit more of the HTML stuff available for readers, even if that isn’t my purpose in creating this. A point raised in a number of the other posts was about how often such a website would need to be checked, to make sure the archive had current information. Although the game is still somewhat new, much of it has been rabidly consumed by fans, and so I do not anticipate great changes in coming years. So, perhaps once a year for the next five years, and then once every five years after that, an archivist could check for changes and update if necessary. For the videos, I used a website to download the .MP4 of a let’s play. While this isn’t the best quality, because the graphics of Undertale are MEANT to be seen as a somewhat low-fi/throwback development, the lack of video quality is not a huge issue. Ideally, getting the original files from a gamer would be most ideal. One great point Amy raised in a comment was how this could be a great opportunity to link from one section of the package to another, and you’ll see I did that here. 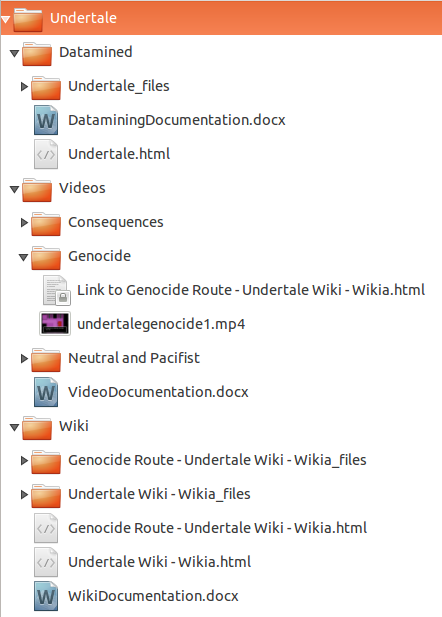 In the Genocide video folder, I linked to the wiki entry on a Genocide run of the game– that way, some of the materials in the collection can more easily serve as documentation for other bits of the collection without taking up more storage space. Primarily, I see the videos having links to materials from datamining and the wiki, not the other way around. The exception to this would be perhaps videos that show all the fates that could reach one character (put in the “Consequences” folder); those could be linked to the wiki entries on individual characters. This allows views to see the collection’s connections between different elements, rather than requiring that they make such connections themselves. I have a documentation word document in each folder. This would likely include a few things: an index of sorts, notes on authorship, and dates of access/acquisition of the materials, to start. The last is particularly important for the websites, which could change at any time, and if they did change, the documentation could help archivists keep track of how many versions they have. This kind of data would be crucial for the videos, which when downloaded in the way I did, lose much of the metadata YouTube stores about them (user who uploaded them, date of upload, etc). 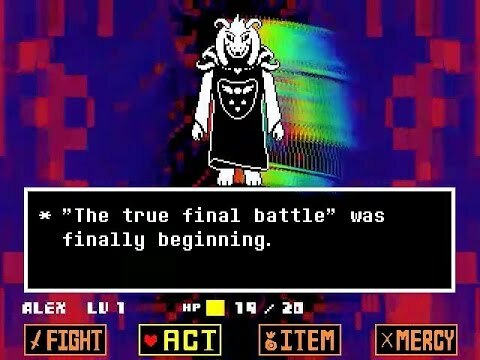 Having some idea of when the videos were uploaded to YouTube helps place the LPer within the span of “Undertale’s history” as well: how they play the game depends a bit on how well they know it; if they made the LP in early days, then they might have been shocked/surprised by things, and that can be good data for the user to have, even if the LP does not contain commentary. The set of items that needs documentation the most is the Mirrawrs datamined materials. While some of this is self explanatory, much is not, and it seems imperative to have a certain level of description about how the data/numbers work presented here. While I do not myself have such information, it might be worth doing a quick interview with Mirrawrs, include it in this section, and use the data from such an interview to inform the use of the documentation on the datamining section. Conclusion: Is this the final battle? I think there’s a good bit of room to tweak elements here. 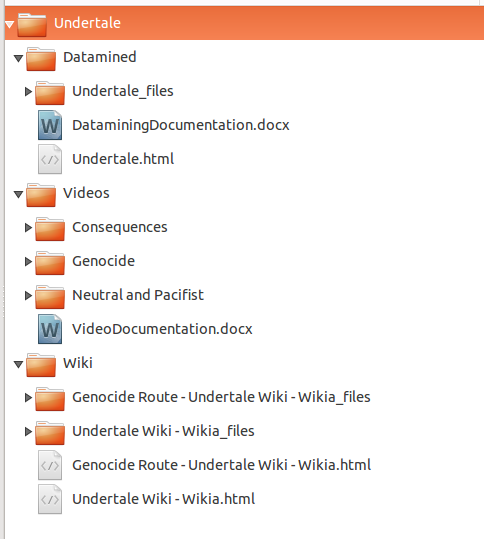 I like that this structure allows for users to enter into the videos or wiki section without knowing much about Undertale, and they’ll quickly get a good understanding of the material, but the datamined section is much more challenging to interpret, and even with detailed documentation, I think it would be a challenge. Still, I think this is a place to start documenting the video game known as Undertale, and hopefully additional resources will contribute to popular and scholarly understandings of this game. Among the many challenges involved in identifying @mothgenerator-related material of significance and hatching a plan to preserve it, the greatest by far has been metadata. In assembling an Archival Information Package for material documenting @mothgenerator, I had high hopes of being able to put together a METS file with descriptive, administrative, technical, and structural metadata for the entire AIP. I had been looking at Archivematica’s documentation for METS implementation in AIPs as a potential model but quickly realized that, between the variety of content and material types in the AIP and only beginner-level understanding of METS elements and attributes, I would have a nearly impossible time trying to piece together on my own what a full-service digital preservation system could produce relatively quickly. 1_Drawing_Program. Files associated with the drawing algorithm behind Moth Generator. 2_Twitter_WARC. Captures of the @mothgenerator Twitter feed recorded with WebRecorder as WARC files. 3_Twitter_Archive. Tweet archive downloaded from the @mothgenerator account. Includes tweet data as both JSON and CSV. 4_Digital Images. 4,000 digital images previously generated by the drawing algorithm and published by @mothgenerator, captured and stored as JPEGs. 5_Process_Docs. A collection of tools, texts, and images created in the process of building Moth Generator. 6_Artist_Interviews. Captures of online interviews, news coverage, and essays related to Moth Generator, the artists’ bodies of work, and Twitter bots in general. 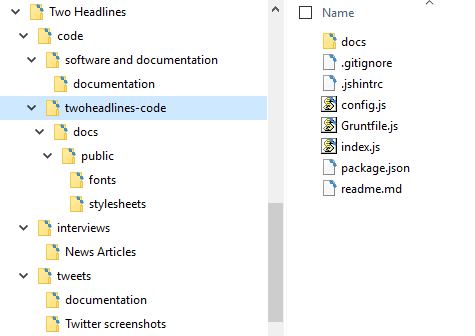 An overview of folders in the Moth Generator AIP. One of several ways in which FITS and I didn’t get along. Adventures in metadata creation continued as I experimented with different tools for generating file inventories and checksums. Having had repeat bad luck running FITS on its own, I next tried DataAccessioner, a GUI tool developed at the Duke University Libraries. To use DataAccessioner, one identifies a source and target directory, excludes material not for accessioning, enters Dublin Core description at the collection, folder or file level, and clicks Migrate. DataAccessioner will move the selected material to and from the specified locations, and output an XML file with technical and administrative metadata like file formats, file size, and checksums. 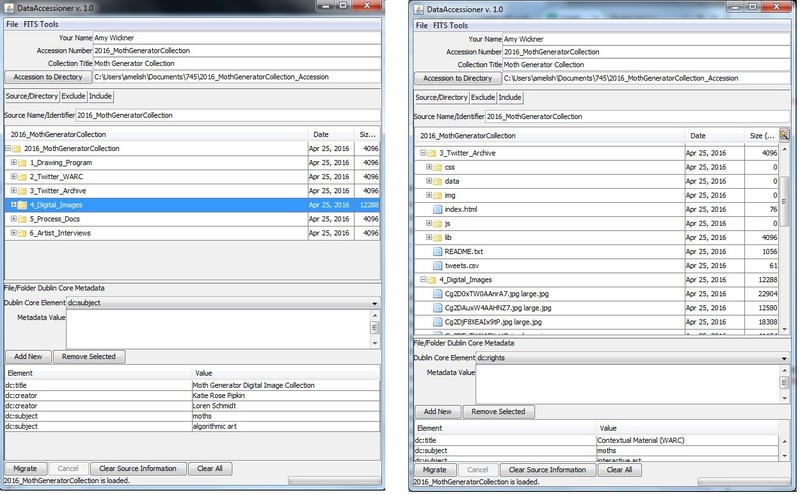 Entering metadata (left) and looking over file structure (right) in DataAccessioner. Collection-level metadata (DC) created with DataAccessioner. File-level technical and administrative metadata (PREMIS) created with DataAccessioner. This file is the key outcome, for me, of using DataAccessioner in the first place. 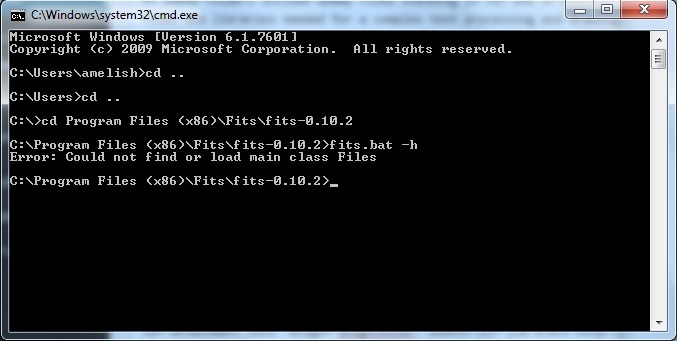 It uses FITS for file identification, and the ability to add description is helpful, if super slow by hand. The XML output can be transformed with XSLT or with this handy-sounding GUI — have not yet had a chance to try it. There are other ways to transfer files — if this was 100% archival material I might have tried creating a bag with BagIt or Exactly — but this XML output is really helpful. Although I had started “cataloging” AIP contents at item-level, the prospect of re-entering it all in DataAccessioner or writing XML more or less by hand did not fill me with joy. A heavy-duty repository system would have let me ingest metadata from a spreadsheet (don’t hate, appreciate). 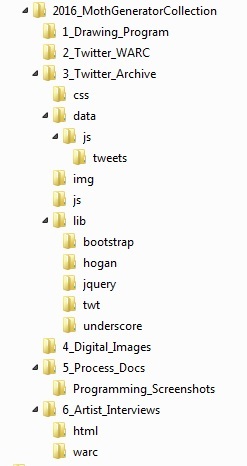 I settled on assigning Dublin Core (15 elements) to the collection as a whole and to each of the six high-level folders. 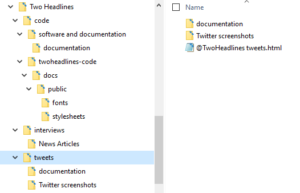 For the last folder — 6_Artist_Interviews — I went one level further down to distinguish between the rights situations of articles saves as HTML pages versus recorded as WARC files. I used the Getty Art & Architecture Thesaurus for subject terms, in part to see how far Moth Generator could stretch it. Overall, this stage of the project has renewed my appreciation for the batshit crazy world of metadata creation and reconciliation in digital preservation, much of which is now accomplished by cleverly designed tools and therefore taken for granted by the blissfully ignorant rest of us. I subscribe to the prevailing (?) wisdom that sometimes it’s best to let the bits describe themselves, but also need the occasional reminder that blood / sweat / tears makes this possible. I had also been feeling pretty smug about how good @mothgenerator was looking in WebRecorder, and thought I had things wrapped up. 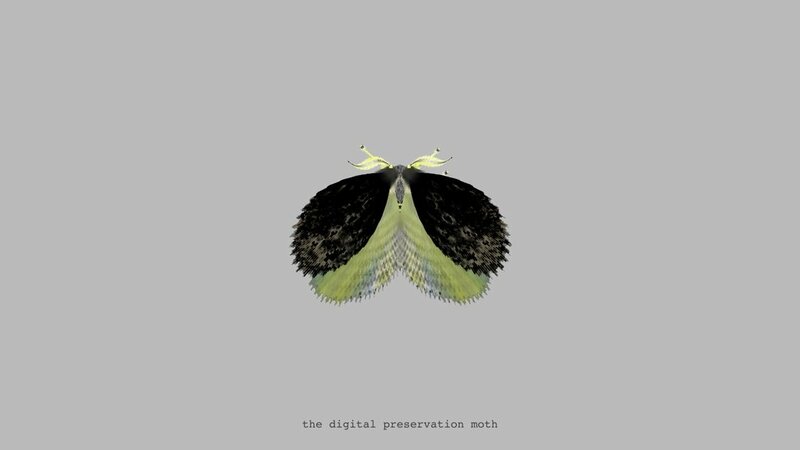 But the Digital Preservation Moth politely begged to differ. 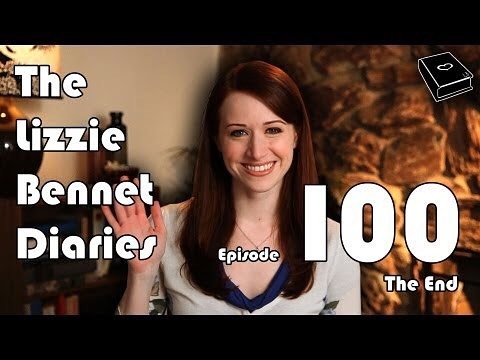 The preservation plan for The Lizzie Bennet Diaries will consist of the main character’s social media accounts; including, but not limited to Twitter, Facebook, Tumblr and other related accounts for each character. I decided not to preserve the videos themselves, because they have already been properly preserved in the form of YouTube, streaming, and DVD formats. In addition to creating videos that were directed to their audience, the “characters” interacted with their audience in real time. The majority of the social media accounts are no longer active, however, they still remain live. I have chosen to utilize the company ArchiveSocial to capture and preserve the social media accounts. I’m not going to try to not repeat myself too much as I’ve already a lot about Two Headlines here and here. 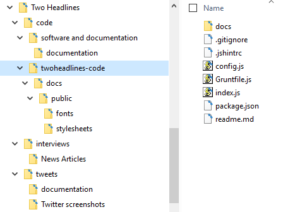 So, before I get into the archival information package, Two Headlines is a small bit of programming that combines two headlines from the Google News API and posts them to Twitter through the Twitter API with the help of some bits of code that are freely accessible to programmers through Node.js. Two Headlines has been used to teach programmers about creating twitter bots and it is a form of social commentary. Its tweets are also funny and entertaining. As there is software that needs to be installed involved, creating readmes that include instructions on how to install and operate the programs should be created. It does no one any good to include software that doesn’t have instructions, especially as the software is not designed to be used by people that have little to no programming experience. Since this is just a model AIP, there are only a few files represented. The AIP will consist of three main folders, one for the bot’s source code and the software and documentation to edit that code, one for any interviews or comments about the bot, and the final one for the tweets themselves and the software that to read them and its documentation. While the file types for things like the source code for the bot and the installer files are already dictated by their creators, any new files created will be to current preservation best practices, PDF/A for the text files and .tiff for images. 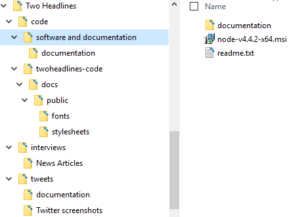 other readme files associated with the programs, is also in the folder. Any one that responds to questions about their interactions with the bot, its significance and influence, will have their responses preserved in this folder. News articles and blog posts will also be included here. 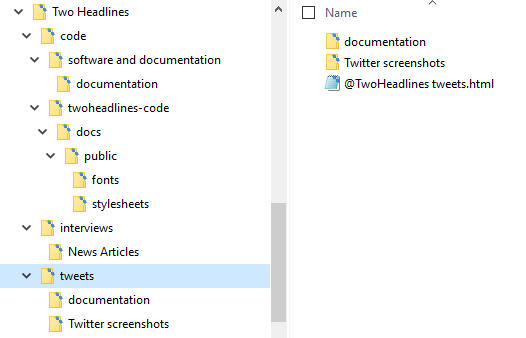 readme file will be added so that any users know how to install and use the included software to view the tweets. It will also include metadata about the collection of the tweets, including the time and the code that collected the tweets and a record of any modification that was done to them post-collection. A few screenshots will also be provided to show the original Twitter interface that will not be archived with the tweets themselves. While this is a good start to preserving an entertaining bot, there is more work that could be done. The next steps for this project would be to actually conduct the interviews and acquire permissions for the news articles and blog posts and submit the AIP to the Internet Archive. There would also need to be a mechanism in place to collect the new tweets from the bot, as it posts every few hours, and add them to the preserved files. Since my core content is already well preserved on the Internet Archive, YouTube, and the original site, since the contextualizing information has been meticulously captured by dedicated fans and posted to the HR Wiki, and since the community remains active through the Homestar subreddit, doing the actual preservation work was in the end highly redundant. The work has been done and well. So instead, here is the intellectual exercise of how to organize the data were it to be captured and preserved by a different kind of organization: a major research university. While the argument has been made for preservation by original order, homestarrunner.com is organized in categories and then largely chronologically, but not purely so. The content here is organized to reflect as closely as possible the organization of the content as it appeared on the site (with major groups first and then release order) while still making it easy to navigate for novices and scholars. In addition I’ve broken out the content of the creative and auxiliary content discussed below. 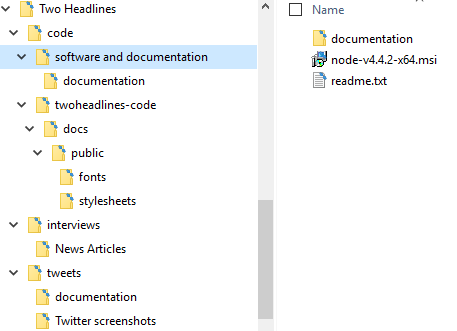 The first part of the Archive is the Administrative Data organized under the ReadeMe folder. This folder contains the information that captures intellectual control of the materials contained in parts 2-4 of the collection. Sections Two and Three house the creative content of the Homestar Runner Archive. 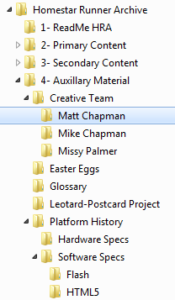 Each of the individual folders for a primary video contains both a master copy of the video as well as a data file (to accompany the imbedded metadata). The Master Video file will be the best available copy of the most recent and accessible version, the least compressed; in short, the version from which future migrations should be made. 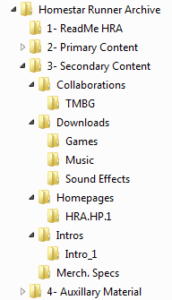 The Data File will contain up-to-date curated content from the HR Wiki, plus additional information as relevant for each file. The Data Files will contain transcripts, references, links, Easter egg lists, and routing. 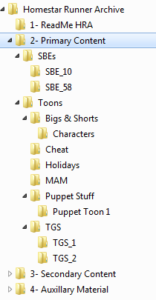 For example, Teen Girl Squad #1 is actually a Strong Bad Email, so instead of duplicating the content, the folder for TGS #1 will route to the appropriate SBE folder. 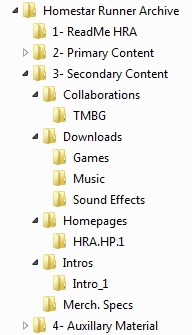 Part 3: Secondary Content. Everything else. 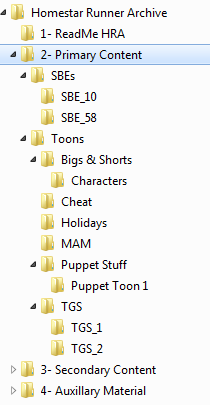 This folder contains everything else produced for the site. Like the Primary content, this will consist mostly of master copies of AV content, such as the website homepages or music videos, and the associated data files. However, it also includes free downloads, collaborative materials, the live-action puppet videos, and merchandise lists to help collectors track licensed products. Section Four comprises materials relevant to a full understanding of the Homestar Runner Archive, but not a part of the creative content. With the content so well preserved in so many locations, the next logical steps for a research institution interested in the not only the social impact but the research potential of this collection would be to make overtures to the creators to see what interest exists in the preservation of the creating tools, what oral histories could be captured about the creation and creative process, and what original media still remains that might bolster a digital collection for the edification of future generations.